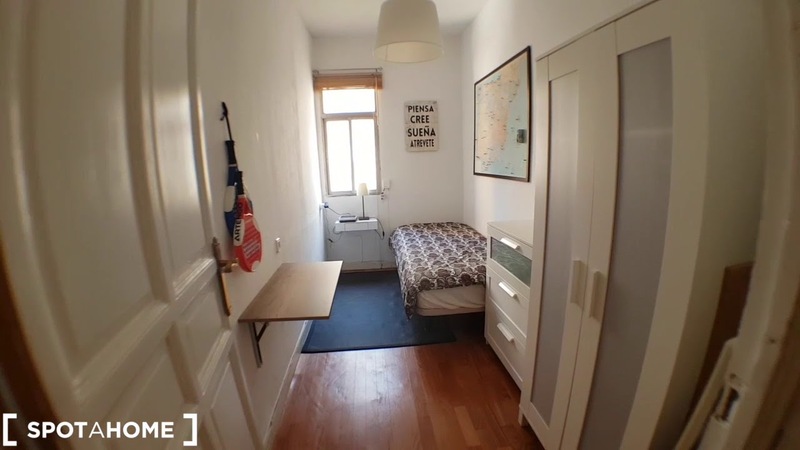 A sunny room is available to rent near Metro Iglesia in Almagro & Trafalgar. The apartment has a stylish living room, where you can relax on the cozy couch and get to know your new flatmate, or sit down to a delicious, home-cooked meal at the large dining table. The kitchen has all the essentials, including an oven, a stove, a microwave, a dishwasher, a washing machine, and a lovely breakfast nook. ​ The room for rent has lots of natural light, and it is well-furnished with a comfortable single bed and lots of storage space for all your things. In the bathroom, you'll find a big bathtub. You'll be living in Almagro & Trafalgar, 1 of Madrid's most central and well-connected neighborhoods. You'll have it all around here-- restaurants, cafes, bars, and shops are on every corner around the area. And, with a Metro station practically at your doorstep, you'll never be far from anything in Madrid! A Metro station is practically outside your door! The room for rent in spacious and sunny. The apartment is a 1-minute walk from Metro Iglesia. You'll be sharing the apartment with the live-in landlord, a friendly 45-year-old man who works as the director of a hotel. He enjoys cooking almost every day, playing sports, and having nice experiences.